28-Mar-2018 Updated the monthly poll. Cast your vote now! We are an association of former military dependents who were stationed on various Air Force Bases around the world and who are dedicated to reuniting with those long lost friends from so many years ago!. This site originated in Jan 1996 with an initial list of 340 names from the Vancouver reunion. It has grown to over 13,000 names and continues to grow at an astounding rate every month. As more features are added and updated, (like email addresses, base history, trivia, monthly newsletters and many others) it requires more time, greater resources and extra finances to maintain the site on a day to day basis. All the information available on this site is for personal non commercial use only. Available on this site are lists of BRATs that either lived next door to you, on the same base as you or have the same common background as you had being a dependent of a Canadain Air Force Family. Also available is a collection of other BRAT sites on the net, information about upcoming reunions, air shows, and back issues of the CAFBA newsletter. We will also advertise your product or web site if applicable. The web site is constantly being updated. You may come across some broken links. Let us know if you find any broken links or if you have other information to share. Thanks! If you are a BRAT and your information does not appear on the site, please register here so your friends may find you. Currently full access to the entire web site is available for free to Registered Members. You MUST BE be a Registered Member to gain access. Simply click on any link. If you get a '404 page not available' error please report it. Try using the top navigation bars. This limited time access will end soon. Make sure you sign up for our newsletter (complete the subscription form below) as well as register here your personal information. If you are a BRAT please help develop this site by sharing your pictures, stories and memories. This is a true account of one man's career in Canadian Aviation. 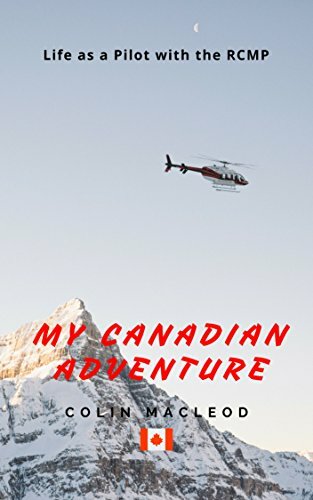 Serving as a pilot with the Royal Canadian Mounted Police for a twenty year period, from 1981 to 2001, operating both helicopters and fixed wing, the author flew into every corner of Canada and was personally involved with many of the significant events of that time. A very personal story, this book is an intriguing, interesting read, providing a unique point of view on this period in Canada�s history. Click on the cover image or title to purchase a copy of this book.